In our minds, athleisure is quite possibly the best trend to ever take off. Seriously, though: what could be better than rocking your favorite sportswear and looking chic while you're at it? Answer: nothing. Plus, celebs like Gigi Hadid, Taylor Swift, Chantel Riley and so many more don their intricately-designed (read: cool-girl-approved) activewear regularly now — and not just to the gym. Quite frankly, there's simply no separating activewear from everyday wear anymore. Showing off a sporty get-up is no longer a sign of "giving up on other clothes" — it's a signal that you're a trendsetter, and quite honestly, that you're on your grind getting things done. Plus, isn't the fact that you can wear leggings and a stylish sweatshirt to class now pretty epic? Long gone are the days of your peers judging you for showing up to class in sweats. Now everyone envies that look. Now as you probably know, myriad brands have jumped on the athleisure bandwagon but none have done it quite like Nike. Enter: their 2016 Tech Fleece Collection, which combines their Nike Tech Fleece with Nike Tech Knit for the first time ever. Think lightweight and ultra-plush material, but warm and breathable at the same time. Oh and did we mention insanely stylish, too? But let's be real: that was a given. So who's the face of Nike's iconic campaign, you ask? None other than gravity-defying, 100-watt-smiling, Olympian Gabby Douglas. (We'll let that sink in for just a sec). When we heard the news, we couldn't help but feel like proud parents of the tremendous girl that recently graced the cover of our August issue. Put simply: she couldn't be more perfect for this role, as she expertly straddles the line of fashion and athletics — look no further than her flawless dark lip on the floor for proof. 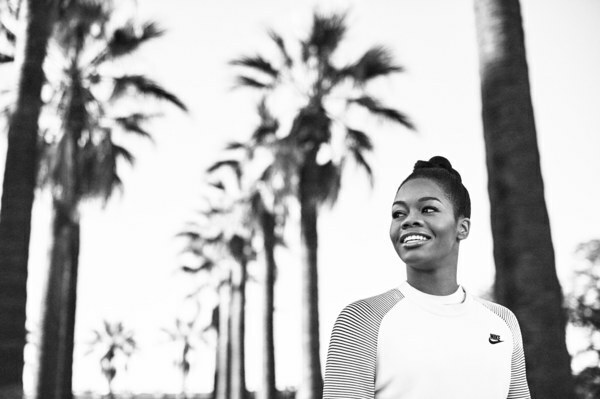 Not only is she a fiercely inimitable athlete, but she's also a young woman that embodies everything Nike stands for: honor, perseverance, success, and fun. Naturally, Gabby slays in the collection — see below for the exclusive Teen Vogue photos! — and is further proof that we all need to jump on board the athleisure train immediately. And to celebrate the groundbreaking collection which hits stores today, we're teaming up with Nike to bring you an exclusive, almost-too-fun-to-handle, Tech Pack Studio event on September 1 from 6-9PM at The Grove in Los Angeles. You can expect to see Gabby (obv!) talking with Teen Vogue editors about everything from fashion and beauty, to her golden moments at the Games. There will also be hair braiding, a chance to test-drive the new Nike Tech Pack collection, and one-on-one styling sessions with an acclaimed Teen Vogue stylist. With that said, we'll assume you're all as psyched as we are, so go ahead and RSVP here to attend. In the meantime, check out our Facebook Live chat with Gabby about her experience in Rio, her struggle to overcome criticism on social media, and her plans for the next Olympic games. Spoiler: it's safe to say she won our hearts all over again.